My "Bunny Hops" Collection is yet another in this series! That's right, folks! Spring is in the air and has inspired me to create all things springy! hahahaha Hence my two matching collections "Just Hatched" and "Bunny Hops". 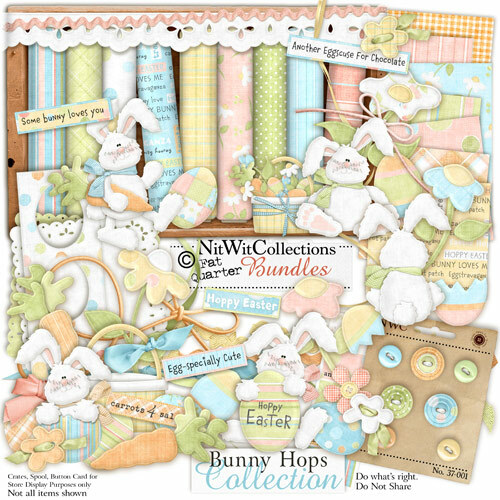 Bunny Hops is a collection of darling little bunnies, carrots, flowers, baskets, and colourful eggs all ready and willing to help you create wonderful Eastery/Springy/or just plain happy layouts! It's coloring, patterns, and adorable elements are perfect to help us all celebrate the holiday as well as the season! Hippity hoppity hooray! 7 buttons in various springy colours! 5 darling little bunnies in various poses!